What is the Account-Based Ticketing (ABT) System? The Account-Based Ticketing (ABT) System enables commuters to use credit, debit, ATM or pre-paid cards with contactless function for fare payments. During the pilot, only Singapore-issued Mastercard/Visa/NETS contactless bank cards will be accepted. There will be no need for upfront top-ups when using your credit, debit or ATM card for fare payments. Similar to any Mastercard/Visa/NETS contactless purchases, your bus and train transactions will be processed, accumulated and charged to your credit, debit, ATM or pre-paid cards. Commuters will be able to track and view their journey and fare history via the TransitLink ABT Portal or TransitLink Mobile Services app. Why introduce the ABT system? This new initiative ties in with one of the key pillars of Singapore’s Smart Nation vision – Smart Mobility, and taps on digital payments technology to provide commuters with a more convenient way to pay for public transit, as well as an enhanced travel experience. What are the benefits of the ABT System? The ABT System will eliminate the need for a separate transit card and the hassle of topping up your transit cards. In addition, the ABT System will enable commuters to track and view their journey and fare history at their convenience via the TransitLink ABT Portal or TransitLink Mobile Services app. Who can assist me if I encounter problems at the point of boarding or alighting? Please contact your Issuing Bank if you encounter problems after registering and adding your card in the ABT Portal. Where can I refer to for more information? More information on the ABT System and the Pilot is available on the TransitLink ABT Portal. For enquires on the use of the NETS contactless card, please contact your respective Issuing Bank. When can I start using NETS contactless card for fare payment? How do I use my NETS contactless card for transit? You just need to tap your registered NETS contactless bank card at the card reader at the train gantry or in the bus at the point of boarding and alighting. Are the NETS contactless cards linked to my ABT Account transferable? No, the NETS contactless cards that are linked to your ABT Account are non-transferrable. May I tap my wallet or bag at the card reader? If you have more than one contactless payment card (Mastercard/Visa/NETS contactless bank cards, EZ-Link cards, NETS FlashPay cards or others) in your wallet or bag, you may experience card clash. An error message may appear and you may be denied entry or exit, or charged more than once because multiple cards are detected. To avoid card clashes, please remove your registered Mastercard/Visa/NETS contactless bank card from your wallet or bag to tap at the card reader to enter and exit, and always tap in and out with the same registered card. Otherwise, it will be considered as two separate fare transactions. What should I do if I lose my NETS contactless card that was registered for transit? If you lose your NETS contactless card that was registered for transit, please call your Issuing Bank to report loss and prevent misuse. How do I register for the pilot again if I lose my registered NETS contactless card? You may register for the pilot again with your replacement card via the registration portal. In the event that the pilot programme is fully subscribed, you will not be able to add a card for transit usage at that point. No, you will not be able to use your NETS contactless cards for transit if you have insufficient funds in your bank account. You will have to add additional funds into your bank account. You may then visit the General Ticketing Machines to check if your card is good for transit. Can I continue to use my NETS contactless card for transit after the end of pilot? You will be able to continue to use your NETS contactless card for transit until further notice. Is the service applicable to all public train and bus services? Yes, you can pay for both train and public bus fares (basic, premium and express bus services) with your NETS contactless card under the ABT System, except for private buses. Please note that for premium bus services, your NETS contactless card can be used to pay for fares only if they are operated by public transport operators (PTOs) and not private operators. 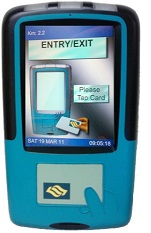 All PTOs-operated buses (basic, premium and express bus services) are installed with a standard card reader as shown below. Are there any changes to the fares when using my NETS contactless card for transit? No, the fares charged using NETS contactless cards are the same as card fares. Please refer to ptc.gov.sg/regulation/bus-rail/fare-structure for more information on fares. Please note that concessionary fares and travel passes are not available as part of this pilot. No, the reader will only display “Bank Card Usage”. Why am I unable to see the fare charged at the point of exit? Due to the system nature of ABT, the computation of fare calculation is not instantaneous in comparison to card-based transactions. You will be able to find the details of each transaction in your ABT Account on the TransitLink ABT Portal or TransitLink Mobile Services app. If there are any discrepancies* in your travel transactions or billings, you may submit your claims for the travel transactions of the cards that are linked to your ABT Account via the “My Claims” page on the TransitLink ABT Portal or TransitLink Mobile Services app. Claims can only be filed for transactions that are up to 14 days after the date of incident. For commuters who have not signed up for an ABT Account or linked their cards to their account, please do so via the TransitLink ABT Portal or TransitLink Mobile Services app. Please note that you can only view up to the last 90 days of your transaction history. * Do note that if the point of entry or exit is not recorded in the ABT System. A flat fare will be charged, regardless of the distance travelled. I have an additional charge of $2.00 on my statement, why is this so? If you exceed the time limit allowed for exiting a station, you will be charged an additional Rail Overstay Charge of $2.00, on top of the actual fares incurred. Why am I unable to participate in this pilot? You may not be able to participate in the event that the pilot programme is fully subscribed. How do I remove my NETS contactless card from the ABT Portal? You will be able to remove a card previously registered to your ABT Account from the “My Cards” page on the TransitLink ABT Portal or TransitLink Mobile Services app. Once the selected card is removed, all the existing and future transaction and travel history of the card cannot be viewed from the portal. Can I delete my ABT account or transfer it to another person? No, an ABT Account cannot be deleted or transferred to another person after creation. However, you can remove your registered NETS contactless card from your account. A password self-reset feature is available in the login page of the TransitLink ABT Portal or TransitLink Mobile Services app for you to reset your password.